Some things should never be said out loud. Scorpion Tales is a collection of stinging monologues. They are short and powerful and leave audiences stunned. They are not for the faint hearted. Perfect for students studying Drama who are looking for something with bite. The monologues in this volume are designed to be performed in intimate venues and classrooms. All but one (Mary) are completely self contained and require minimum staging. They are adaptable to any environment and can be performed anywhere. That is the purpose of them. They are particularly suited to both the HSC Drama and English syllabuses (NSW) and are intended to be used in the classroom. But they are disturbing. They are meant to be unsettling. They are meant to make us think. I encourage actors to interpret them as they wish and to find their own ways of staging them. For this reason I have kept settings and stage directions to a minimum. Adapt them. Play with them. They are stepping stones to creating something new. To address the imbalance of opportunities for women in Theatre, most of these pieces are written for women. Most are contemporary, or seem it. One is biographical in nature and designed to give a new perspective on a woman remembered for her infamy (Miss Brown). Ask yourself if the story of Mary is familiar? Does it resonate in our current political climate? Would you kill your spouse? If they begged you to end their suffering and preserve their dignity? Where is Harry? Why won’t he come out of his room? And Jimmy Gill? What happened to him? My thanks, also, to the ABC who gave it an excellent review and helped with promotion. Susan Northcott : production assistant. A new production of The Pyramid will be on at the Theatre Royal Backspace in Hobart from September 26th to 29th 2013. Starring Clare Gray, Mark Cutler and Campbell Mc Kenzie and produced with the assistance of the Tasmanian Theatre Company and Cascade Breweries, it will be a wonderful opportunity to witness these talented performers in action. 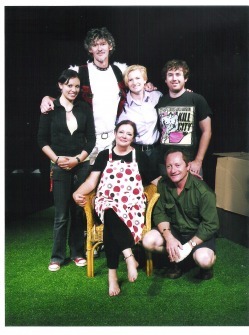 In January 2010 the highly acclaimed theatre company Three To a Room produced the Melbourne premier of The Pyramid. It was directed by Aimee Blesing with Don Bridges as Jack, Felicity Steel as Kate and Mick Lo Monaco as Pete. The season began on Tues 26th January for a two week season. Opening night Wednesday 27th at 8.30pm. Final show was on the 7th February. THERE are moments that induce mild terror in a theatre critic, and one occurred when I realised that one of the speaking parts in The Pyramid belonged to a dog; but it turned out there was nothing to fear. Via successive monologues, we meet sexless suburban couple Jack (Don Bridges) and Kate (Felicity Steel). We also hear much about Pete, Kate's Scottish terrier - the barrier between them. As the drama unfolds, their basic incompatibility is brought into sharp and deadly focus. Then Mick Lo Monaco bounds onto the stage as Pete, complete with fur coat and tail. Though his character threatens to collapse the carefully constructed dramatic tension, his enthusiastic revelations, from a dog's-eye-view, neatly convey the story to its dark finale. There are some flaws: the telegraphing of motives and outcomes, and the milking of Pete's Scottish ancestry. That said, The Pyramid is a finely acted tale of a suburban, sexual tragedy. Set in any ordinary Australian house, on any ordinary street with a husband & wife that you may not look twice at if you passed them, the Pyramid is a tale of secrets, desire, love lost & love found. Jack & Kate live in suburbia with their Scottish terrier Pete. A seemingly happy marriage to anyone on the outside, they have grown further and further apart as Kate finally relents with her struggle over her sexuality. She is ready to leave and begin her new life filled with the travel & adventure & love she has always desired, but is Jack ready to let her go? Directed by Aimee Blesing, the set is minimal, the effects the same which ensures the story has the desired impact needed. You can allow yourself to focus on the story without too much distraction. It had an easy rhythm & flow & the build up towards the surprising turn of events at the end was wonderfully directed. While the story is told through 3 monologues, it is still very much an ensemble piece. Each story cleverly written to intertwine with the next. Opening with Jack( played by the talented Don Bridges), he could be anyone’s neighbour, that bloke that will pop his head over the fence for a chat but always stays a little longer than you would like. Jacks story is of the love he feels for his wife although he lives in a land of blissful ignorance to her real wants and needs. He truly believes he has done enough for her & makes you believe the same. You like him in spite of yourself; he makes you laugh with him not at him as you so much want to. You empathise with him even though your gut instinct is not too. 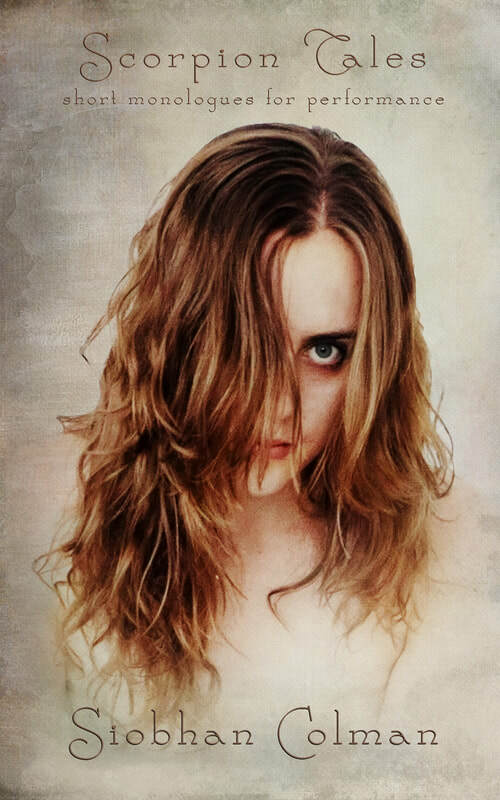 Kate, played with warmth by Felicity Steel, shares her deepest secrets with us. Her loss of her first true love & the building excitement of the next, Has you totally entranced. Her years of living in a loveless marriage are soon to come to an end and you revel in her excitement & wonder how she has managed so long. These are beautifully performed by Don Bridges & Felicity Steel. Jack & Kate’s monologues feel like a conversation that they were having with each individual member of the audience. At times I felt I could have been sitting across the kitchen table, or watching the football in the other armchair as they told their side of the tale. As Pete, Kate’s beloved companion and dog, Mick Lo Monaco bought the energy with him the moment he hit the stage. It can be a little risky to have an actor play the part of an animal without it becoming cheesy and a little tacky, but after the initial shock wears off you once again get caught up in the story & Pete’s knowledge of events, knowing that by the end of it he will help you to solve the puzzle. Mick makes you forget with humour & at times a little terror that you are being spoken to by a dog! I’ll be honest. I had preconceived ideas of this production & I was not expecting to enjoy myself too much at the end of a very long week, & I have come away disappointed. Disappointed by the fact that there were only a handful of audience members at this particular performance. The show is fresh and original everything we thespians complain about not seeing enough of. This show deserves an audience. I enjoyed watching every moment of Three to a Room getting it just right. 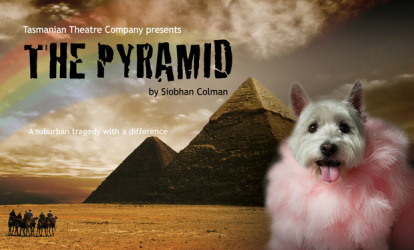 Siobhan Colman’s play The Pyramid is a story about repressed sexuality hidden within a conventional marriage. She is secretly gay, he is blissfully unaware of what his wife really wants, and the dog sees everything. Told in three monologues, this story centres on the wife Kate (Felicity Steel), and her marriage to Jack (Don Bridges). Set in Australian suburbia in the 1980s, we learn how Jack and Kate met, and the reasons that they both give for entering into the marriage. Pete the dog (Mick Lo Monaco) knows Kate’s secret, and is mistrustful of Jack, with good reason – Jack is not all that he seems. Over time, their inherent differences have led to their lives becoming more separated. Kate has decided that she has hidden long enough, and wants to come out, but how is Jack going to take this? This play is a microcosm for a society that doesn’t wish to acknowledge homosexuality. Jack appears as a sweet character that enjoys the simple things in life, and doesn’t understand his wife’s need for exploration beyond their suburban home. He doesn’t wish to ask questions that might take him outside his comfort zone. Kate has chosen her duplicity rather than risk facing her true feelings and being ostracised by society. After being set in their ways for so long, how do they come to terms with the lie that they have been living? Director Aimee Blesing was drawn to the piece by the complexity that creates it. The motivations of the three characters are not always easy to grasp, yet their stories exist within and reflect the real world. The Pyramid raises questions about the idealistic Australian lifestyle by intimately exploring the lives of two seemingly normal people. The set is basic and leaves plenty of room for the performers to work their magic, which they do with aplomb. Don Bridges creates a wonderfully lovable Jack, Le Monaco is hilariously camp as Pete the gay Scottish Terrier, but Kate is the character that is given the emotional depth in this play, and Felicity Steel absolutely shines in her role, holding the audience in her palm. Gripping, funny and tragically real, I would recommend this play for anyone looking for a night out with some meaty, thought provoking drama. Tue. 26 Jan. to Sun. 7 Feb. There, in that mild, wan face of hers—in those painful startings and hurryings when she moved; in that tremulous, faint utterance when she spoke—there,—I could see one of those ghastly heart-tragedies laid open before me, which are acted and re-acted, scene by scene, and year by year, in the secret theatre of home; tragedies which are ever shadowed by the slow falling of the black curtain that drops lower and lower every day–that drops, to hide all at last, from the hand of death. – Basil, Wilkie Collins, ch 11. A deviceful little three-part suburban gothic that starts out as a cringingly gentle domestic reminiscence, leaps somewhat loosely into a saccharine cream-and-apricots lesbian romance, lurches recklessly into an abrasively loud gay-dog comedy sketch, before finally jabbing you in the arm with a very sharp surprise that turns the whole clever thing on its head. Written by Siobhan Coleman, directed by Aimee Blesing, with Don Bridges, Felicity Steel and Mick Lo Monaco. I confess I was done in completely by this piece. It’s a kind of three-by-three monologue structure, where the husband (Bridges), the wife (Steel) and the dog (Lo Monaco) each deliver three consecutive monologues. The whole way through I was carping to myself about the flimsiness of the structure, the awkward tonal shifts between each of the three acts, its introverted theatrical ambition (much more like a radio play or short story) and how it was all so plain—warm, gentle and funny, also, but definitely plain. It got a bit livelier when Pete, the dog, did his routine, but even then there was something predictable about it. Then of course the penny dropped and it all suddenly looked very different. My complaints about tone and dramatic structure transformed at a single revelation into lamentations about the spiritual emptiness of suburbia and marriage without love. It was all kind of meta, really. Nevertheless, it’s still hard to get a sense of the relationships described in this play, because they are only described. Though each performance is endearing (even Bridges, dammit), they are also discrete, and don’t cohere until we are given the key to the riddle, the secret of the pyramid, at which point the gothic code becomes visible; but even then the characters only cohere in a gothic (cold blue) light. This is no doubt because the characters are, by Colman’s own confession, mere ciphers for broadly drawn types in the Australian community, rather than more specifically evoked creations. Even Pete. Ah, yes. Pete. Does anyone remember the wee Scottish Terrier in the movie The Body Snatcher, Grayfriars Bobby? So disciplined, temperate, quiet and respectful. Not a bit like Mick Lo Monaco’s Pete. His brain-stinging yap would be the envy of any alpha-aspiring Maltese or Shitzu, and he brings the stentorian personality to go with it, too. It’s funny, mostly, but relentless. I was having Boris Karloff shovel fantasies at one point. But then, Grayfriars was probably a highly repressed melancholic even before his master’s death. If he had had a proud neighbour like Pete … but now we’re drawing near the play’s moral and Colman herself is explicit enough in the program notes about that, about what she thinks her play actually means. We don’t need that. It should be easy enough to fathom the happy moral once the grim surprise hits home. The Pyramid is a suburban tragedy with a difference, breaking through the banality of everyday marriage to reveal inner personal battles that have devastating consequences for the small family of three involved – married couple Jack (Don Bridges) and Kate (Felicity Steel) and their Scottish Terrier Pete (Mick Lo Monaco). As naff as humans acting as animals can be, Lo Monaco is definitely worth seeing as Pete, the glue that arguably keeps Jim and Kate’s marriage intact for longer than it should have. He’s their substitute for a child and ultimately Kate’s confidante; in what happens in many marriages across suburban Australia, the couple can’t talk to eachother so they talk to the dog instead. Consequently, Pete has a lot of secrets to reveal. We sense that Jack and Kate have ‘settled’ for the sake of growing old with company rather than alone, and it becomes obvious very quickly that the only passionate love Kate can feel is for other women. And consequently, so begins a series of three monologues (one from each character), agonisingly charting the demise of their small, seemingly ‘normal’ family unit. Jack’s monologue could have been extended on – I felt there was more to come from this character. Thanks to talented scriptwriter Siobhan Colman, the characters of Kate and Pete both have fantastic material to deliver, and Steel and Lo Monaco do both their pieces spine tingling justice, especially Steel, who has the responsibility of the most complicated character of the three. There’s a confrontingly real sense of Australian domesticity conveyed by the set: a very ordinary living room and kitchen scenario. It’s what we discover that happens away from the comforts of the TV and the kettle that is most disturbing. It’s a shame that this show is somewhat hidden away in the audience-specific Midsumma Festival – I have a feeling it would have a considerable impact if presented in a more mainstream program. Independent producers Three to a Room continue to find perfect casts, encourage intelligent directors and present scripts that remind us why we go to the theatre. The how-to-write books talk about bringing yourself to your stories and using your own experiences, and too often the subsequent writing reads like student political publications or shouts limited opinions to the converted or those who will never be converted. Then the playwrights wonder why anyone dares call their work boring. Reading playwright Siobhan Colman’s program notes, The Pyramid appears as a very political work about social expectation and the violence so sadly inherent in many queer communities. However, there is nothing in her work that shouts, bores or preaches. She brings personal experience and the experiences of her friends and community to the stage, but uses these tales to create a story with emotion and empathy that reaches far beyond its subject matter. Her plot is original and told with a cleverness that catches its audience off guard. It’s told through three monologues. There’s Jack (Don Bridges), who got to sleep with his first love for 20 years and is happy to see the world on the television; Kate (Felicity Steel), who never lied to her husband about her first love, but he never asked the right questions; and Pete (Mick Lo Monaco), the Scotty terrier whose lust for the butch neighbourhood dogs is only surpassed by his loyalty to Kate. Each has its own tone and Aimee Blesing’s direction delicately guides the revelations that gradually reverse the audience’s sympathies, without detracting from the early experiences and empathies. There’s obvious craft, skill and passion in Colman’s writing, but ultimately The Pyramid is engaging and original theatrical story telling. It’s also her first play. If this is what she’s writing for her first attempt, I can’t wait to see what she does next. The Pyramid was chosen to be part of the 30th Anniversary of Sydney Gay and Lesbian Mardi Gras celebrations in 2008. It was produced with the assistance of the Blacktown Arts Centre and Blacktown Council. The Pyramid is a dynamic new theatrical work by Siobhan Colman. Premiering at the Blacktown Arts Centre, and an official event of the Mardi Gras Festival 2008, the play explores queer identity and the circumstances through which homosexuality is hidden and rediscovered. Set in a suburban Australian household, The Pyramid is a tragi-comedy which addressesthe consequences of repressed sexuality and thwarted dreams. It delves into the lives of Kate, a housewife who is a closeted lesbian and about to come out, Jack, her husband who is ignorant to his wife’s true identity and Pete, their gay Scottish Terrier who sees everything and knows more than he should. The Pyramid is Siobhan’s debut as a playwright and director as a recipient of a mini-residency grant at the Blacktown Arts Centre in 2007. It has provided her with the industry mentorship required to write and direct for theatre, building on her success as a published writer and novelist. The play is presented in three monologues, exploring the inner dimensions of it’s main characters. “It was challenging to use monologues but I wanted to explore the depths of peoples private thoughts within a household which can be very different from what is openly expressed in everyday conversation” said Ms Colman. The Pyramid will be playing for a one week season only. For bookings please call (02) 9839 6558.